Interlake Mecalux has equipped the new Orchestra warehouse, a business with more than 700 children’s clothes shops in 40 countries, in Saint-Laurent-Blangy (Northern France) with selective pallet racks and the high-density Pallet Shuttle system. Designed in cooperation with the logistics specialist Log’S, this new strategic alliance is called Orlog. With this combined solution, the company seeks to increase storage capacity and speed up order prep. Who is Orchestra Log’S (Orlog)? Orchestra, founded in 1995 and based out of Montpellier, is a company specialized in baby care products, as well as fashion for children and maternity wear. Its success has allowed it to expand in France and abroad. Log’S and Orchestra have optimized their logistics activity via the creation of the operator Orlog. Currently, Orchestra does business in 40 countries with more than 700 stores throughout the world and 3,000 employees. The Orchestra Club, offering its members year-round 50% discounts on its fashion collections, has more than 3 million consumers mainly from Europe, Morocco and Canada. The solid expansion experienced by Orchestra in the last decade meant the Saint-Aunès logistics center, close to Montpellier, was full to overflowing. Consequently, the company was forced to divide the goods between the various warehouses of the zone, which entailed a high logistics cost that could rise over time. Faced with this situation, Orchestra decided to build a new 12.4 acre logistics center in a business park in Saint-Laurent-Blangy, which is very close to a main transportation hub, facilitating the distribution of its goods to all of Northern Europe. Moreover, anticipating the business’s enlargement, the warehouse may be expanded to 29.7 acres. To achieve a high-capacity warehouse space and one that would streamline the order prep process, Interlake Mecalux has supplied selective pallet racks and the compact Pallet Shuttle system. The pallet racks are set up in all the warehouses within the Orchestra logistics center. Meanwhile, the semi-automatic Pallet Shuttle system is just in one of the warehouses. The mixing of these two solutions provides Orchestra with a 73,000 total pallet storage capacity, with an additional 25,600 slots for boxes. Pallets are 32" x 48" in size with a 1,764 lb maximum unit weight. Pallet racks that measure 38' high were installed in the eight segmented warehouses that comprise the center. Workers use reach trucks to access the highest shelf. This optimal storage system, taking into account the assortment of pallets that Orchestra works with and the flexibility this affords, occupies the majority of the warehouse’s surface area. Additionally, the Interlake Mecalux selective pallet racks provide direct access to pallets, for fast-paced merchandise management and order preparation. Due to this large variety of pallets, the racking levels were adjusted to the goods being stored and to its operations. Picking is done directly off the pallet in the lower rack levels, leaving product reserves on upper levels. In addition, and given that picking is the warehouse’s main operation, wire shelves were placed in some levels of the racks. Thus, boxes with the smaller sized items can be housed. To pick items located on the first few levels, the operators use order pickers that raise to an appropriate height. In one of the eight warehouse installations and alongside the pallet racks, two blocks of racks incorporate the high-density Pallet Shuttle system that accommodates 2,000 pallets. This solution, 36.7' high and with five load levels, makes full use of the available space to offer a greater storage capacity. Storage processes are tablet run, through which orders are sent to the Pallet Shuttles. They have a touch-screen interface and a very intuitive software that requires no special training to use. Each tablet can interact with all the shuttles in the warehouse, following a prioritization ­protocol. Its operation is quick, simple and requires minimal movements: the operators place the motorized shuttle into the channel, they deposit the pallets into the first position of the racks, and the Pallet Shuttle transfers them directly to the first free location autonomously. When removing the goods, the same process takes place but in reverse order. The facility has reserve batteries, so operations are not brought to a stop at any time. You can load a piece of equipment while the Pallet Shuttle continues to operate in the assigned channels. Batteries extracted from the shuttles are connected by simply fitting them into the charging stations set up in the warehouse. 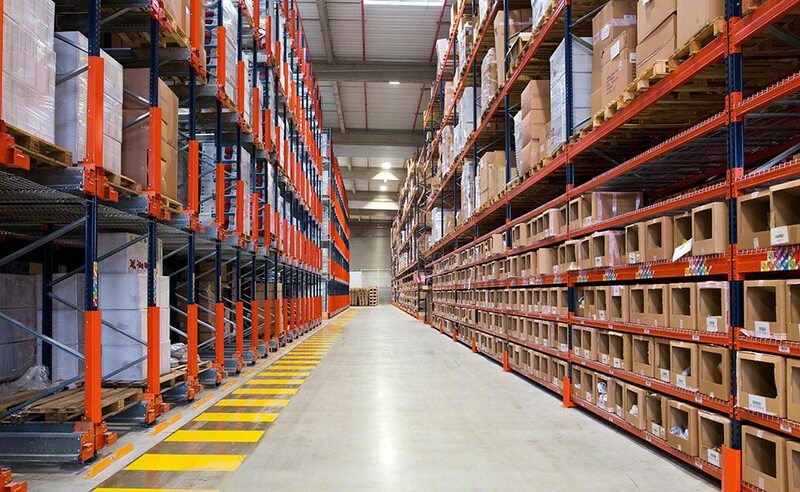 The forklifts do not enter the aisles, so the risk of accidents from blows against the rack structure is virtually nil. In turn, the shuttle is equipped with various electronic and mechanical components that guarantee its smooth operation. Furthermore, the Orchestra warehouse also features protective mesh panels on the sides of the racking and under the first level to prevent the accidental fall of the goods. High-density storage: the Orchestra installation is capable of storing 73,000 pallets and has 25,600 spots for 16” x 16” x 24” boxes. The 32" x 48" pallets weigh a maximum 1,764 lb each. Diversification: thanks to the provided solutions the company can store a huge variety of products of different sizes and weights. Optimal organization: the distribution of the racking blocks ensures a steady, precise flow of stored inventory. Safety guaranteed: both the Pallet Shuttle and the warehouse racks have safety devices to protect the structure, the goods and the workers to the fullest.